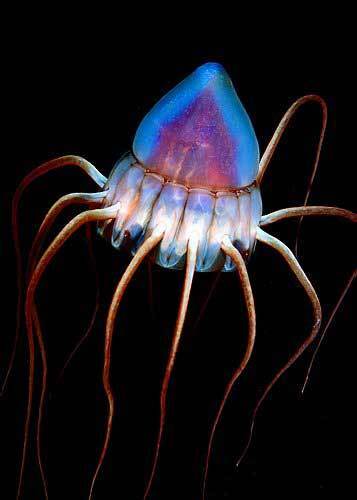 Helmet jelly Periphylla periphylla, copyright Erling Svensen. The Scyphozoa are a group of cnidarians including the typical jellyfish and related taxa, united by the presence of polydisc strobilation in metamorphosing polyps (further modified in some rhizostomes), rhopalia and ephyrae. Most scyphozoans have a life-cycle alternating between a sexually reproducing planktonic medusa and an asexually reproducing benthic polyp (Daly et al. 2007). [CS-P86] Clausen, C., & L. v. Salvini-Plawen. 1986. Cnidaria. In: Botosaneanu, L. (ed.) Stygofauna Mundi: A Faunistic, Distributional, and Ecological Synthesis of the World Fauna inhabiting Subterranean Waters (including the Marine Interstitial) pp. 33–42. E. J. Brill/Dr W. Backhuys: Leiden. [DM01] Dawson, M. N., & L. E. Martin. 2001. Geographic variation and ecological adaptation in Aurelia (Scyphozoa, Semaeostomeae): some implications from molecular phylogenetics. Hydrobiologia 451: 259–273. [G79] Glaessner, M. F. 1979. Precambrian. In: Robison, R. A., & C. Teichert (eds) Treatise on Invertebrate Paleontology pt A. Introduction. Fossilisation (Taphonomy), Biogeography and Biostratigraphy pp. A79–A118. The Geological Society of America, Inc.: Boulder (Colorado), and The University of Kansas: Lawrence (Kansas). [G75] Grant, E. M. 1975. Guide to Fishes. The Co-ordinator-General's Department: Brisbane (Australia). [MH96] Miller, S. A., & J. P. Harley. 1996. Zoology (3rd ed.) Wm. C. Brown Publishers: Dubuque (Iowa). [P79] Petersen, K. W. 1979. Development of coloniality in Hydrozoa. In: Larwood, G., & B. R. Rosen (eds) Biology and Systematics of Colonial Organisms pp. 105–139. Academic Press: London. [RM04] Raskoff, K. A., & G. I. Matsumoto. 2004. Stellamedusa ventana, a new mesopelagic scyphomedusa from the eastern Pacific representing a new subfamily, the Stellamedusinae. Journal of the Marine Biological Association of the United Kingdom 84: 37–42. [W79] Werner, B. 1979. Coloniality in the Scyphozoa: Cnidaria. In: Larwood, G., & B. R. Rosen (eds) Biology and Systematics of Colonial Organisms pp. 81–103. Academic Press: London.